Friends of the Umbrella Tree say they have everything in place to take on responsibility for 100+ year old Weeping Ash tree, which they want to see live out its remaining life. 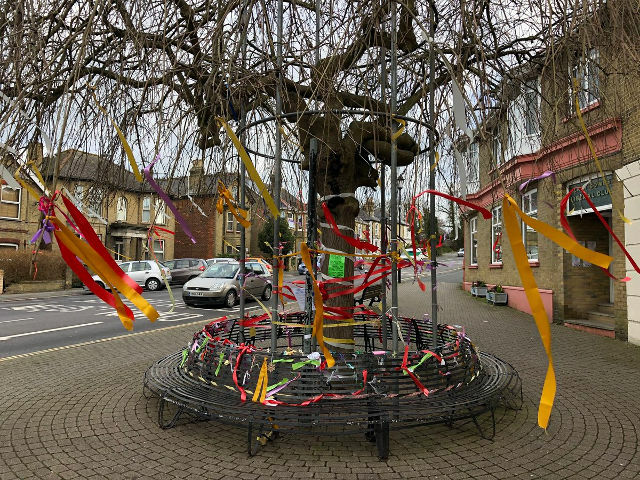 The Friends of the Umbrella Tree say they now have all the necessary insurance and experts on hand to take over responsibility for the Umbrella Tree in East Cowes. The East Cowes Umbrella Tree was planted over 100 years ago by Queen Victoria’s roads manager and a campaign was launched to save the tree at the beginning of the year after the Isle of Wight council (via Island Roads) said they would be removing it and replacing with a 3ft Birch tree as the Umbrella Tree was infected with fungus and dangerous. Chris Gutteridge and Bev Webster have written to East Cowes Town Council, the Isle of Wight council and Island Roads requesting permission to take over responsibility for the tree. obtained Public Liability insurance of five million pounds. arranged for a highly qualified tree surgeon to carry out regular and frequent safety checks on the tree. put into place very experienced engineers to construct whichever framework is drawn up by a structural engineer. that engineers will commission said structural engineer to draw up detailed plans to be built to his specification. These plans can be inspected by yourselves if you wish. They add that all work and costs incurred will be paid for by the Friends of the Umbrella Tree. 3 Comments on "Give us responsibility for the Umbrella Tree, say Friends"
Good luck with that…. you can 100% rely on our council to ignore best advice and the wishes of those that elected them! Seriously though, that is excellent news. OTOH the council are renowned for washing their hands of things so it could work out for the best…. While you can only applaud the community effort, I really don’t see the point of throwing money at the ultimately doomed project of propping up a dying tree. Surely endeavour could be better spent looking a suitable new centrepiece at this location. One that is not diseased and decaying but instead looking to the future. I really do not understand why there is this drive to try to save a tree that will ultimately die, why not just replace it with a new mature tree of similar type.